—LTR: Tony Klem, Johan Fourie (Manager), Graeme Van Breda (#1), Kyle Robinson. —Heat one + turn one = 2nd place. —Jongingozi Super Master. Mata au hi made (Until the day (we) meet again). • RED SQUARE STARTING GRID LINE UP: Graeme van Breda, Pieter De Vos, Kyle Robinson, Tony Klem, Johan Le Roux, Michael Smit, Rodney McLachlan, Jaco Gous, Hennie Du Plessis, Sid Farinha, Stuart Russell, Raymond Keel, Stewie Christie, André Denoon, Hannes De Vos, Appanna Ganapathy, Abrie Marais, Hano Van Der Merwe, Peter Clark, Ian Harwood, Mike McSkimming, JB Schoeman, Jason Joshua, Henk Schuiling. I’m stuck—traffic congestion! Is there another way? Maybe. Then for a moment it subsides, I see Zwartkops, and I’m glad to be home. /Let's waste time/ Chasing cars/ Around our heads/ ... —Snow Patrol, Chasing Cars (https://goo.gl/UB19R). The day starts at a somewhat slow pace, as if the Masters have some kind of fear of what lies ahead: two gruelling heats of 10 laps each. My head seems to think that fear has dumped then into this state of lethargy, but, my heart wouldn’t buy it. The Red Army has already completed 12 heats, and with five still to come, it is expected that they would look somewhat weary. And yet, if you converse with them, they have this kind of (muffled) excitement in their voices. With my Circadian rhythm back on the clock, I look forward to the—THUNDER! On the north side of the Red Square garage, at the back, nemesis Graeme Van Breda, is setting up camp. Everything is in tip top shape, just like his hairdo. Flanking him is Ian Harwood, Mike McSkimming, Jaco Gous and Michael Smit. In the south-west corner Jason Joshua, newbie to the Club, sets up his superbike in the demarcated area with the help of ever friendly Robbie Breakspear. On the south side (opposite number forty-one), Pieter De Vos and JB Schoeman take up positions. This is like a Church: The Red Square Kawasaki ZX10R Masters form these small animated clusters inside this symbiotic structure. And this is how they will group for the remainder of the season, always in the same place, with the same neighbour, supporting each other in every way. And if time permits them to race next year again, they will do it in exactly the same way. The main entrance of the Red Square race garage houses the two larger groups. 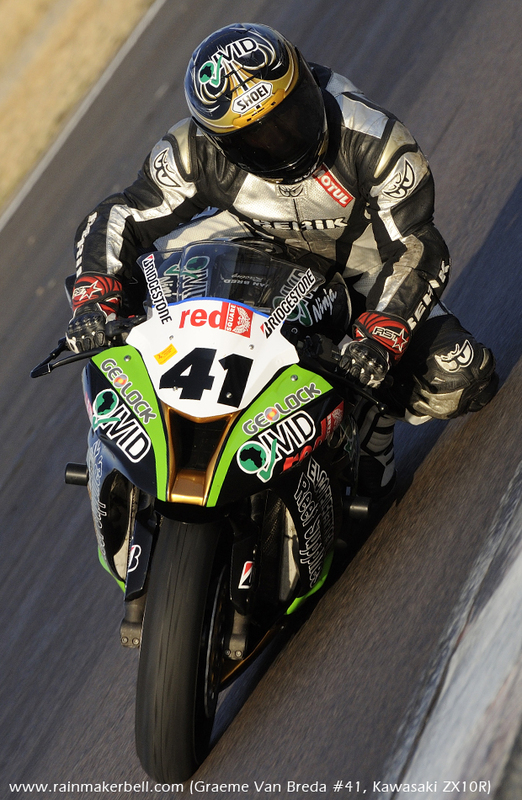 To the north: Johan Le Roux, with his newly wrapped Tandoori Masala Broccoli Brinjal Kawasaki ZX10R, takes up first slot. Next to him Peter Clark, Tony Klem, Stuart Russell and Abrie Marais. Opposite: André Denoon, Hano Van Der Merwe, Kyle Robinson, Raymond Keel, Sid Farinha and Rodney McLachlan. Later that afternoon, I watched the last Red Square Kawasaki practice session from the top of the main Zwartkops pavilion. Those lingering on track appeared frail on the throttle, as if they are trapped in a state of terminal frost (also the title of a great Pink Floyd song). Surprisingly, Kyle Robinson gave it his all, flying down the main straight with every passing lap, as if tomorrow doesn’t exist. Confirming that predictions, as I did with my pre-race column, are deceitful. Could he take two chequered flags away from Graeme Van Breda tomorrow? We’ll see. I stand proudly, as the sessions head to an end, to be associated with such a great outfit. 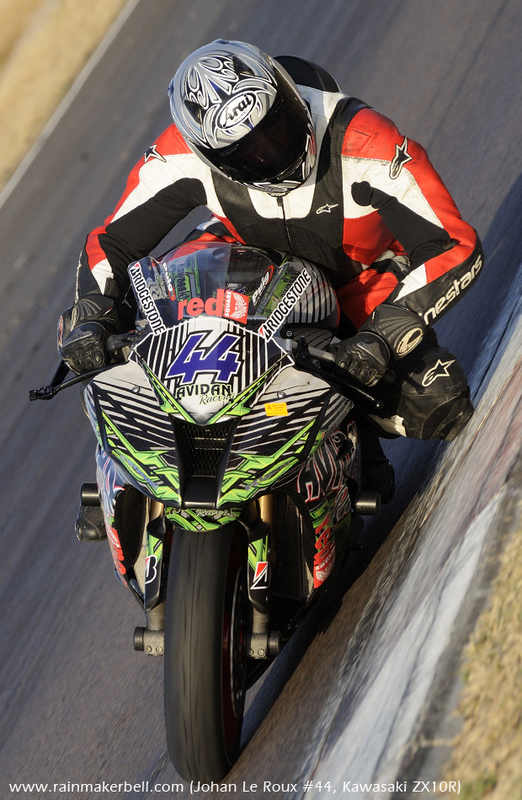 For the ill-informed: I do the features and photos for the Red Square Kawasaki ZX10R Masters Cup. I would like to thank Johan and Lynette Fourie—of Silverton Bolt & Nut—for the ticket contribution. It made a world of difference, to a spectrum that has never seen motorsport up close. And did they enjoy it? Of course they did—it was out if this world. The Masters wait impatiently for their first heat. There is no time for trivial conversation. Their minds are focussed, their heartbeats raised (and they are not even on the grid yet); they think of nothing, except winning (or losing, or crashing). Johan Le Roux, Peter Clark and André Denoon look hesitant today. They will not say it out loud, their eyes, their sombre facial expressions tell more than you think. All three took heavy spills over the past few rounds. Today they will either man up, or throttle with great caution. The garage stifles me; I pick my gear up and head off to turn five. Superpole (a timed event to establish starting grid positions for motorcycle racers/riders) yielded the following starting grid: #41, #17, #18, #13, #44, #49, #42, #43, #61. I have made certain predictions in my previous article, of who will occupy the top six places on the roster for heat- one and two. After the first chequered flag, I was gobsmacked with the way Tony Klem excelled from always being third or fourth on the roster, to a very prestigious second place. It was definitely uncharted territory for him. He has worked tirelessly throughout the year, definitely deserving this second place on the podium. Congratulation—Number Thirteen! One thing that elude Tony thou, was Rider of the Day. Hennie Du Plessis was crowned with this exquisite title. Race One (top six): Graeme Van Breda (with a best lap of—01:04.059), Tony Klem, Pieter De Vos, Kyle Robinson, Johan Le Roux, Michael Smit. 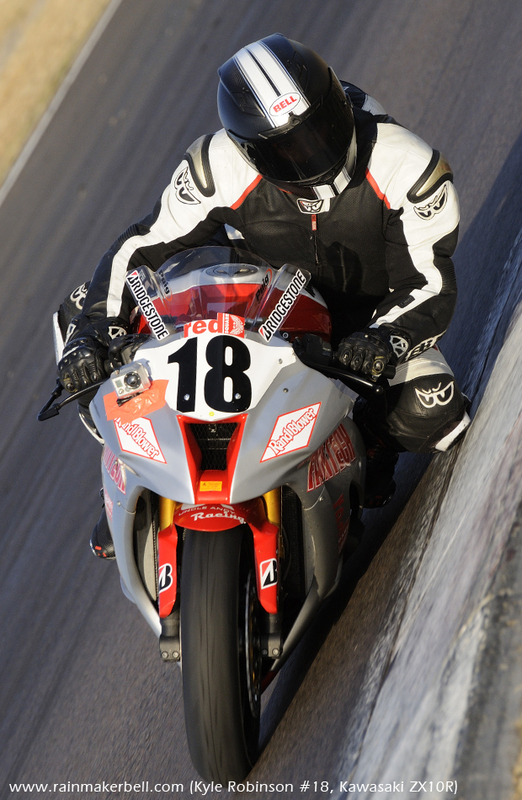 Race Two (top six): Graeme Van Breda (01:04.247), Kyle Robinson, Tony Klem, Pieter de Vos, Johan le Roux, Hennie Du Plessis. By this time, Graeme Van Breda has reached a very comfortable lead over Pieter De Vos. With the season reaching the twilight stage, I definitely hope that Pieter will be able to pull a rabbit out of the hat (very soon), before the final chequered flag drops. The sun is touching the brim of the horizon. Poignantly watching how a whole Red Army camp gets vacated in minutes. A race garage that once contained dreams and aspirations is now empty. 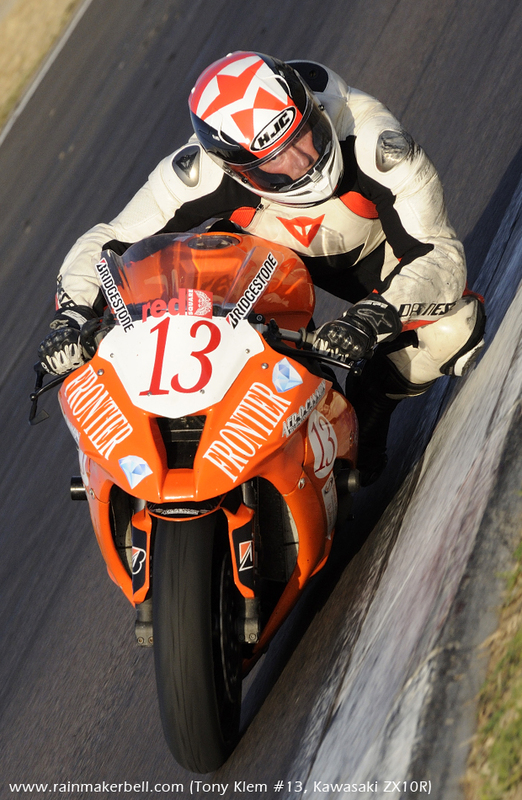 The day is gone; the motorcycle racing is over, only the kinetic energy in our minds still run. It is time to leave this behind, and go home. 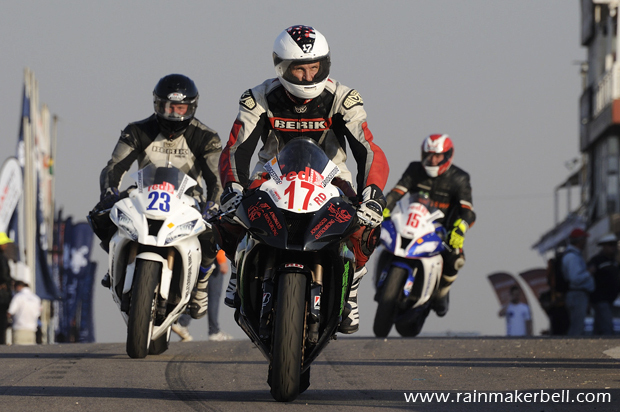 Please circle these dates: 23 + 24 September 2015, for round seven of the Red Square Kawasaki ZX10R Masters Cup, at the illustrious Zwartkops Raceway. 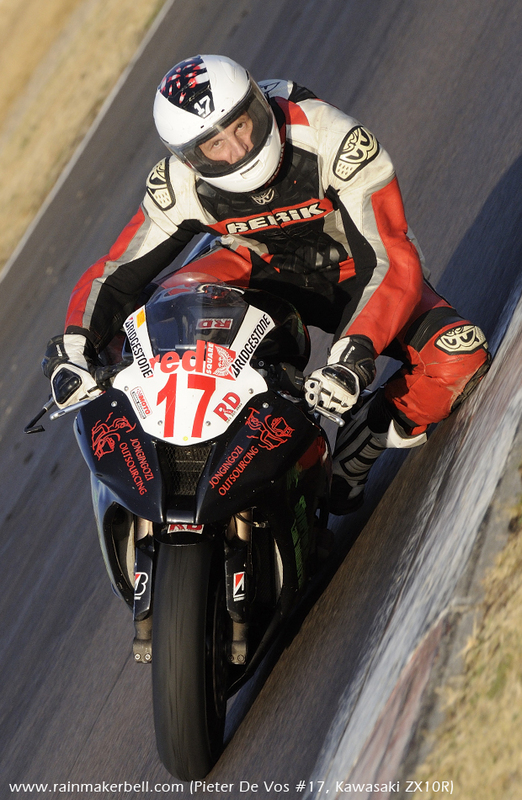 After this, it's downhill to Killarney (Cape Town), then back for the final round at Zwartkops Raceway. —Family: JB Schoeman, Pieter De Vos, Hannes De Vos. — Tandoori Masala Broccoli Brinjal Kawasaki ZX10R. 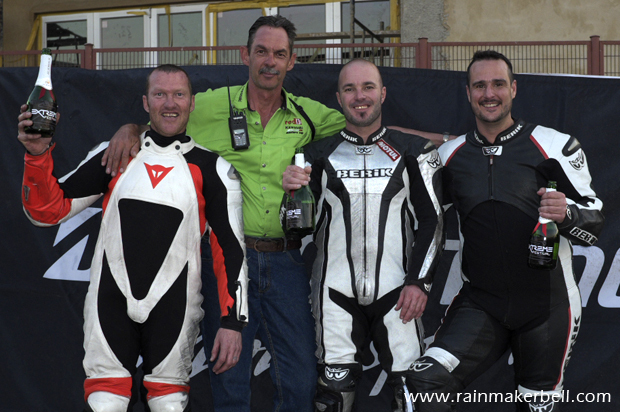 © 2015 www.rainmakerbell.com - Extreme Festival, Red Square Kawasaki ZX10R Masters, Zwartkops Raceway, South African Motorsport, 2015/08/08. 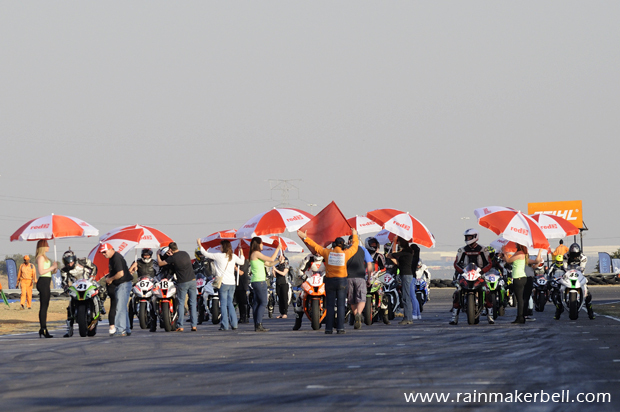 DOWNLOAD: Red Square Kawasaki ZX10R Masters PHOTO ALBUMS (ZIP): 1 (8MB) + 2 (8MB) + 3 (8MB) + 4 (8MB).